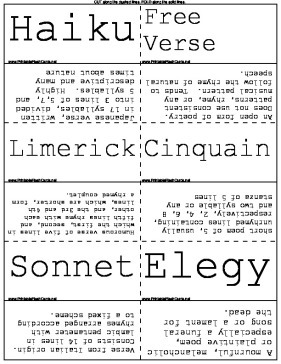 Learn about form and structure in poetry with this literary word search. Free Verse An open form of poetry. Does not use consistent patterns, rhyme, or any musical pattern. Tends to follow the rhyme of natural speech. Limerick Humorous verse of five lines in which the first, second, and fifth lines rhyme with each other, and the 3rd and 4th lines, which are shorter, form a rhymed couplet. Sonnet Verse from Italian origin. Consists of 14 lines in lambic pentameter with rhymes arranged according to a fixed scheme. Elegy A mournful, melancholic or plaintive poem, especially a funeral song or a lament for the dead. Ballad Retells an event in history, in the news, or in your life. Ode A formal, often ceremonious lyric poem that addresses and often celebrates a person, place, thing, or idea. Prose The ordinary form of spoken or written language, without metrical structure, as distinguished from poetry or verse. Sestina A complex French verse form, usually unrhymed, consisting of 6 stanzas of 6 lines each.